Resolved issue with problems for WB 7.3 brought to my attention. DELETE PREVIOUS version BEFORE installing this version. This is, by far, my favorite fall blind that I have ever made. 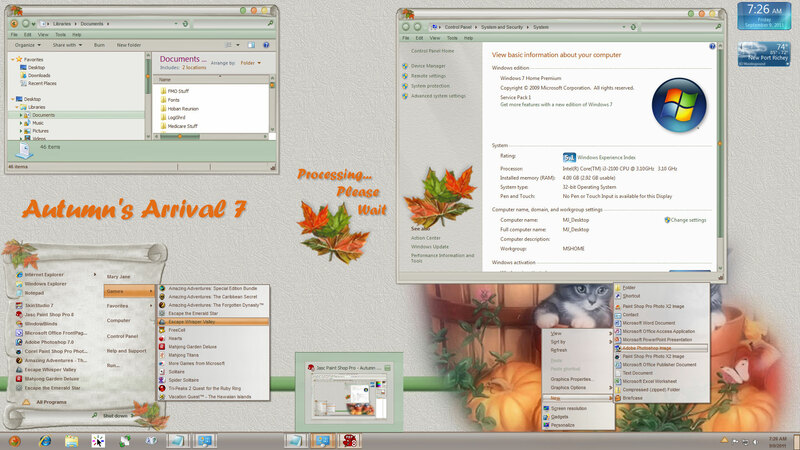 I just couldn't get the Vista version of this blind to look good on my Windows 7 machines. So,I decided to update the blind for Windows 7 only. The XP and Vista versions of the blind are still available in my gallery...see below. For Windows 7 only! However, I think this blind may work on Vista too...I left the Vista specific graphics in this blind. Fancy font included. Made in SKS 7.2, optimized for WB 7.2. Updated/changed many of the graphics from the earlier versions of the blind, but maintained the original look/feel to the blind. Enjoy the colors of Autumn! Beautiful, clean, and sweet jazzy. Thanks for sharing. I have the Vista one and I Love it! On the 23rd I will change over to it! GORGEOUS as usual, Jazzy! LOVE the colors, I have windows 7 and it is awesome! Thanks for a beautiful skin as all yous are! Thanks gmc2, sargan, tropicalgirl, and Jim Glad you like! Thank You, this is still one of my Favorites! Hey Ernie...thanks! Didn't know that this version would work on XP! Long time, no see...good to see you back here! This is gorgeous and very calming, jazzymjr! Great job! Thanks, Nimbin...I am waiting to make sure all the bugs are worked out with compatitbility with WB and Win7 before I change over to the 64 bit on my Desktop. I have the 64 bit on my laptop, but am not running WB on it yet.